You wouldn’t believe the loads of free and insanely creative stuff that’s going down tomorrow night at dusk (that’s Friday June 5 at 6 p.m. for all you Type-A personality iCal addicts). The second annual SubZERO Festival is landing in downtown San Jose and running straight through to midnight. According to their website, it’s a “DIY, artistically bent, hi/lo-techno-mashup where street meets geek.” Expect lots of live entertainment, music, 100 artists, street performers and all sorts of right-brained revelry. Check out the artists’ descriptions and see for yourself: it’s like a smaller scale, tragically hip version of Maker Faire. The event coincides with SoFA district’s regular South First Fridays, which has free admission for several little art galleries on the first Friday of every month. Ride the rickshaws from gallery to gallery and practice your art snob grimace just in case someone catches you actually enjoying yourself. 24-hour Open Mic at MACLA, from 6 p.m. Friday to 6 p.m. Saturday. Local artists will be at the gallery, and international artists will perform via Skype. The Metro’s new photo exhibit/experiment. Every month a theme will appear in the Metro paper, and photographers of all skill levels are invited to submit their work. They’ll be shown during the First Fridays art walk, and the public can then vote on which ones get inside the publication. Live opera at the newish Caffe Trieste. Just checked this coffee shop out a few weeks ago and fell in love. I’m also a classical music geek deep down, so I can’t wait for Opera San Jose soloists to give a performance for significantly less than $50 a ticket. All these fellow SJSU students participating. San Jose’s SoFA arts district is an art-lovers delight. On the first Friday of the month (tonight) some of the baddest galleries in town are Free and open to the public. Tonight – 8pm to ?? The night began in the Filmmaker’s/Press Lounge (refreshments and computers) at the Hotel Montgomery. There were only three other people in the room with me. One was a member of the Cinequest staff, and it thrilled me to find that the other two were filmmakers! Director/Producer Craig Saavedra (Rhapsody In Bloom) and Director of Photography Joaquin Sedillo (Veronica Mars) were checking things out on the computers when I approached them for an interview. Hitch a ride Start it up Watch the trailer. I said goodbye to the guys and walked over to the California Theatre. 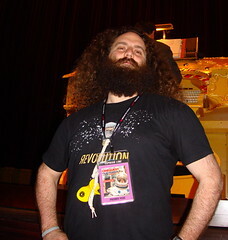 I was sitting alone in the beautiful California Theatre when I noticed Jason. He was front row and center. I asked if the seat next to him was taken. It turned out to be a good choice. Where better to enjoy a film than to next to the #1 movie fan! The proverbial mid-life crisis is an overused premise in modern film making, but I found Eden Court so entertaining I hardly noticed. The laughs came on cue. With the approach of Duncan’s 30th birthday he chooses to run away rather than face the hard truths of his life. He tells a friend that he will find the American Dream, even if he must move to Australia to do it. Kimberly Williams-Paisley’s (Bonnie Duncan) performance could have so easily gone over the top, but she held it to perfection. Stephnie Weir (Barb) kept on a pink robe and a smile on me. Eden Court is the movie to pull out on a dreary day. No matter what changes have been made to the interior, I am anxious to once again have my favorite breakfast – Joe’s Special (scrambled eggs, spinach, hamburger and onions), a chunk of bread and coffee. Hint: To melt the butter patty enough to spread: Place it between the coffee cup and the saucer for a few seconds. My wife and I had never really seen San José till the last weekend. We had passed through Downtown several times, found a few things interesting but never stopped by. Last Saturday, we set out to change that. We lined up a few places to visit in and around Downtown, and planned our route. The first stop was History San José. Gary had aroused our curiosity just a few days earlier. 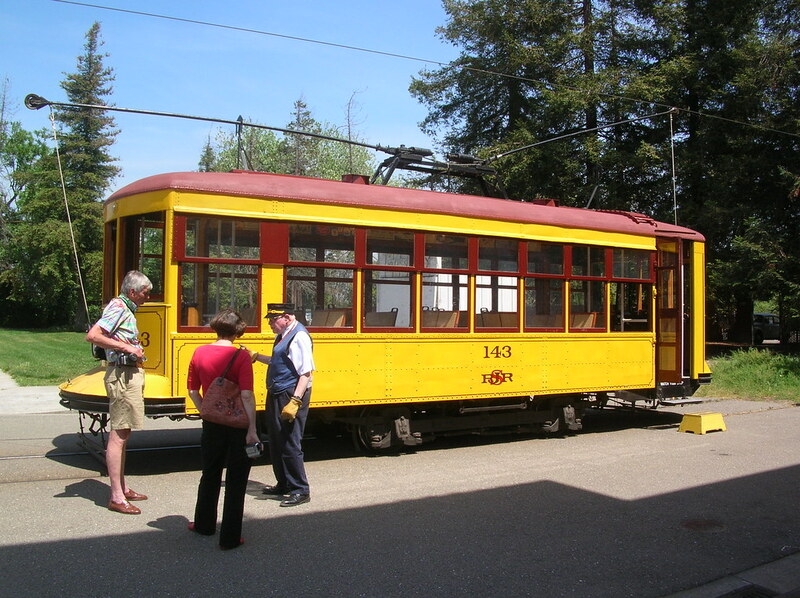 We drove to Kelley Park that houses ‘History’ and got lucky right away — parking was free. No idea why it was so, even though it was a sunny Saturday — no harm done to us. Firstly, I expected more of a museum; but this was in a park setting. There were houses and buildings moved in from elsewhere, similar to a place we had seen in Utah earlier. For us, the highlights of the place were the Light Tower (which was once upon a time used to illuminate the Downtown area), O’ Brien’s Cafe, the trolley ride and the school. As I was approaching Original Joe’s I noticed a sign on the window. 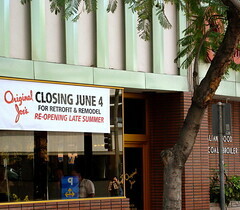 The first thing I saw was, Closing June 4; then the part about the retrofit and remodel. After the initial shock that I would be without Original Joe’s Italian Sausage & Eggs and Cheese Ravioli all summer I hoped that the remodel would not take away the look and feel of the original 1956 style. I just drove a man, in my taxi, who knows the owners and according to him the top will become condos and the restaurant will retain the same early 60’s feel. Posted in Downtown, Food & Drink, News, San Jose, SoFA District | Comments Off on Say it Ain’t So, Joe! For years now downtown San Jose’s South of First Area (SoFA) has been on the brink of finding that magic mix of hot sophisticates, cool unconventional artists, and community who will make the district come alive. 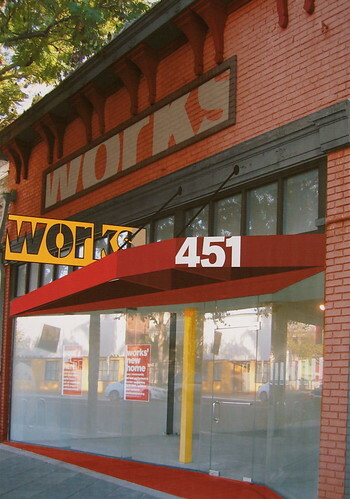 With tonight’s Grand Reopening of the “Works” we find the downtown one step closer. 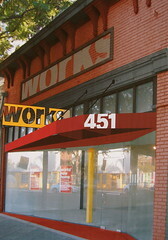 This afternoon at the “Works”, I spoke with John as he was adding some finishing touches to the gallery. He told me that the public was welcome tonight at 7pm and tomorrow would be a special day for children.